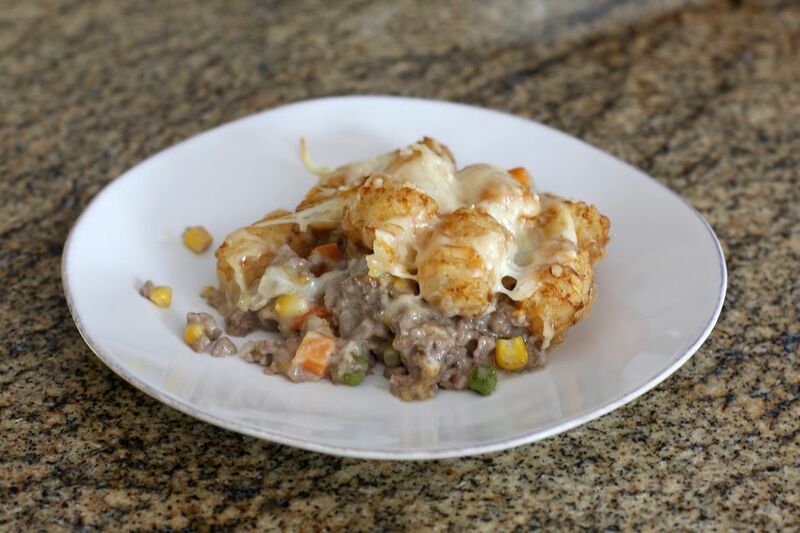 This flavorful tater tot casserole is easy to prepare and cook in the slow cooker or in the oven. Use frozen mixed vegetables or a blend of peas and carrots, and saute 1 cup of chopped onion with the ground beef if you like. Put the ground beef in a large skillet over medium heat. Cook, stirring and breaking up until the beef is no longer pink. Mix the browned ground beef with 1/2 bag of tater tots, cooked veggies, and soup. Spoon into a greased baking dish or buttered slow cooker insert. Layer the remaining tater tots on top. Cover the pan with foil and bake in a preheated 350 F oven for about 50 to 60 minutes; remove foil and continue cooking for 10 to 15 minutes. Alternatively, layer (as above) in a greased slow cooker and cook on low for 5 to 7 hours -- or about 3 hours on high. Note: Use extra condensed soup if the casserole seems very dry.